North America is one of our top continents for sending parcels on a regular basis. Rife with business and home to some of the world's greatest cities, we offer a superb range of services to the States and Canada, starting from as little as £26.20 today. Regardless of the huge land mass these countries possess, we'll deliver your parcel to any city or town. As one of the UK's cheapest online parcel delivery services, we can offer some of the cheapest packages from top couriers like DHL and APC, with an expected delivery time to North America ranging between just 2 - 4 days. As well, regardless of size, as long as your parcel is between 1kg and 500kg, we'll get it up in the air today! It’s important to understand fully the customs and imports regulations when sending a parcel to North America. USA have some of the strictest custom laws, which include the addition of duty or tax to your shipment which will result in charges applying to the recipient of the parcel. For Canada Please see full list of restrictions to Canada here, and for the USA please see here before sending any parcel with Worldwide Parcel Services. Can I ship alcohol to the USA? Subject to limitation depending on the state of delivery at their customs wishes. What insurance is there on my parcel to North America? 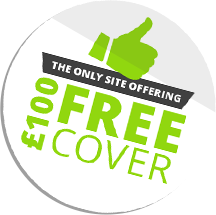 We offer up to £50 free parcel cover. What couriers are available for parcel delivery? To this part of the world, APC and DHL are our world leading courier choices.